As March is Developmental Disabilities Awareness Month, we are proud to celebrate pioneering efforts towards inclusion Dr. Bryan Dague, faculty member at the Center on Disability and Community Inclusion (CDCI), housed within the College of Education and Social Services at the University of Vermont, was one of three delegates invited by the Zero Project to represent Vermont for its innovative work in supported employment. 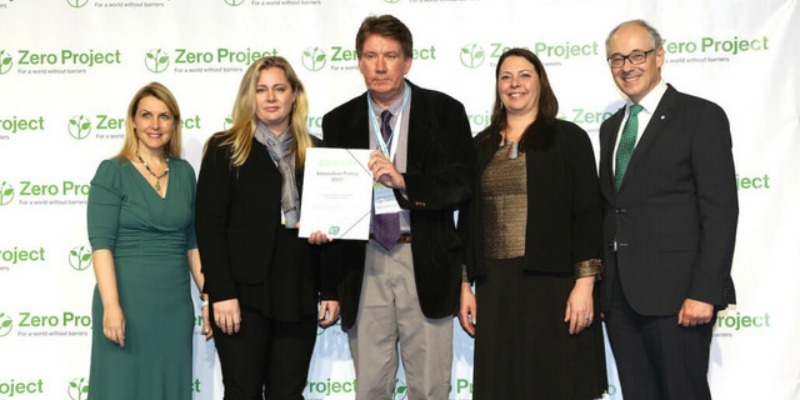 Dague and his colleagues presented at Zero Project's conference and were recognized for their work at the United Nations Office in Vienna on February 23, 2017. Vermont’s Supported Employment Program was awarded based on its innovation, impact, and scalability. The selection process involved more than 1,000 worldwide experts with and without disabilities. More than 500 experts travelled from over 70 countries to attend Zero Project's conference and discuss innovative solutions, practices, and policies related to supported employment. The Center on Disability and Community Inclusion is part of a national network of University Centers for Developmental Disabilities authorized by the Developmental Disabilities Assistance and Human Rights Act of 2000. We congratulate Dr. Dague and his colleagues for their important work. For more information on the Zero Project and Vermont’s Supported Employment Program, please go to www.zeroproject.org.